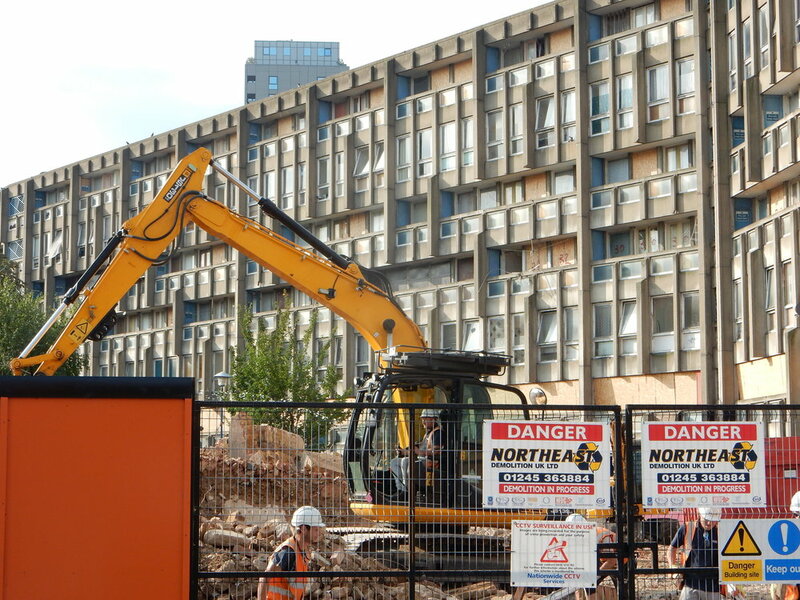 A post from Andrew Parnell as he witnesses the demolition of Robin Hood Gardens. Demolition contractors are now at work at Robin Hood Gardens in Poplar so the Smithsons' New Brutalist housing estate is not going to be with us in its entirety for very much longer, despite heroic efforts led by the 20th Century Society to save it. The western of the two blocks making up the estate is to be the first to go. It's now empty, boarded up and surrounded by hoarding. The eastern block is still occupied and is to be demolished later -- I've heard in two years' time. Before it starts to be destroyed, here's a picture of the West Block in Tuesday's sunshine. The end seems to have been a very long time coming -- it's as if the buildings have been on death row for years. When I explored the streets of Poplar a few years ago I was surprised to find the buildings still standing -- there'd already been so much written for so long about their impending demise. Even then there was something ghostly about the buildings -- it looked as though there had been minimal maintenance on them for some time: concrete was spalling, already some doors and windows were boarded up and the place had a forlorn air about it. When I started doing a guided walk themed around social housing design in Poplar, this sense of impending doom made the site a thought provoking final stop. Here is a photo of what is going to replace the Smithsons' buildings -- at least this is what they're displaying on the hoardings. This is unlike a previous model I'd seen of the proposed redevelopment -- which seemed to involve two slab blocks enclosing a green area of similar shape to that created by the Smithsons' buildings. That shape seems to be roughly preserved in this new version but the surrounding buildings appear to be towers up to about 10 storeys rather than slabs. The Smithsons called this green space a "stress free zone" -- protected from the noise of busy roads either side by their two irregularly curved blocks imperfectly mirroring one other ("split like a kipper" according to Peter Smithson). Right now the quiet of this zone is being ruined by the sounds of the bulldozers! The new buildings also look as though they will take the population density of the site well above the level for which the Smithsons were briefed to aim -- 136 persons per acre, the level that had been recommended for inner London areas in the County of London Plan of 1943 aimed at reducing chronic overcrowding near the city's heart. The Smithsons estate slightly exceeded that target but was excused on the basis nearby areas would be built at lower density. How attitudes and standards change over time! With residential building at "hyperdensity" in blocks of up to 40 storeys taking place not far from the Robin Hood site (at Blackwall and Canary Wharf), will we one day rue the passing of the more moderate levels that planners and designers like the Smithsons were required to adhere to? In any event, we won't be seeing this familiar pair of buildings for much longer.